PBIS DEFINED: PBIS is an approach to supporting students to be successful in schools. PBIS developed from research in the fields of behavior theory and effective instruction. PBIS supports all students through intervention ranging from a school-wide system to a system for developing individualized plans for specific students. School-wide PBIS focuses on the development and implementation of pro-active procedures and practices to prevent problem behavior for all students and improve school climate. As a school community, we are responsible for teaching both academic and social behavior skills. We will teach all of our students how to be safe, responsible members of the community in every setting. We will reinforce these behaviors through a system of positive reinforcement. Tier One - teaching and reinforcement of expected behaviors will be enough support for 80-90% of our students. Tier Two - designed for the 5-10% of our students who may need further teaching and individualized supports. Tier Three - designed for the 1-5% of our students who continue to display behaviors of concern despite Tier two interventions. The Response to Intervention (RTI) team implements support and/or services. In order to address problem behaviors, we will change the way we look at behavior. Behavior is not good or bad. We understand repeated problem behaviors serve a purpose for the student. Problem behaviors provide attention or an escape from uncomfortable, difficult, or even boring situations. Misbehavior is a form of communication. Our job is to use professional judgement to hypothesize the purpose, or function, of behavior and how it meets a need for the student. We then work to find an alternate way to meet that need in a safe and respectful way. Parents of children with behavior challenges are important in a system of school-wide positive behavior interventions and supports because they already know punishment does not teach skills. Parents already know what individual strategies may work with their own child. Parents are important contributors in developing school-wide PBIS in their child’s school, because parents have a great deal at stake – the lives and futures of their children. By becoming involved, parents can have a vital role in improving school climate, safety, and instructional time. Most important, parents can have a role in helping their child to develop the positive behavior skills that are the foundations for a successful future. We are committed to preventing inappropriate behavior before it occurs by intentionally teaching and reinforcing expected behaviors. Tier I – Minor Behaviors: Behaviors handled in the classroom using intervention strategies and teachable moments including a verbal reminder, re-teaching, positive reinforcement (four positive reinforcements for every correction), and redirecting. Tier II – Minor Behaviors: The students taught AND re-taught the expectation AND has received positive reinforcement to promote the expected behavior however, the student continues to present escalating behavior and is not responding to interventions. Fill out a Referral form and check the box for Minor Behavior. Teacher turns the completed Referral form into the office at the end of each day. If a student receives three Referrals for Minor Behaviors in a month-long period, the teacher will follow the procedures for a Major Behavior and the Assistant Principal/Principal will take action. Tier III – Major Behaviors: The teacher has followed through with Minor Referral forms, reflection sheets, teacher conference and parent contact, yet the student chooses to continue behavior that is not consistent with SUCCESS BOUND and/or the student exhibits Level 3 behavior which requires mandatory office referral. Fill out a Referral form and check the box for MajorBehavior. The referrals are then sent to the office and the Assistant Principal will take action. If the Assistant Principal is not available, the Principal will take action. If the Principal is not available, the counselor will handle the situation until an administrator is available. 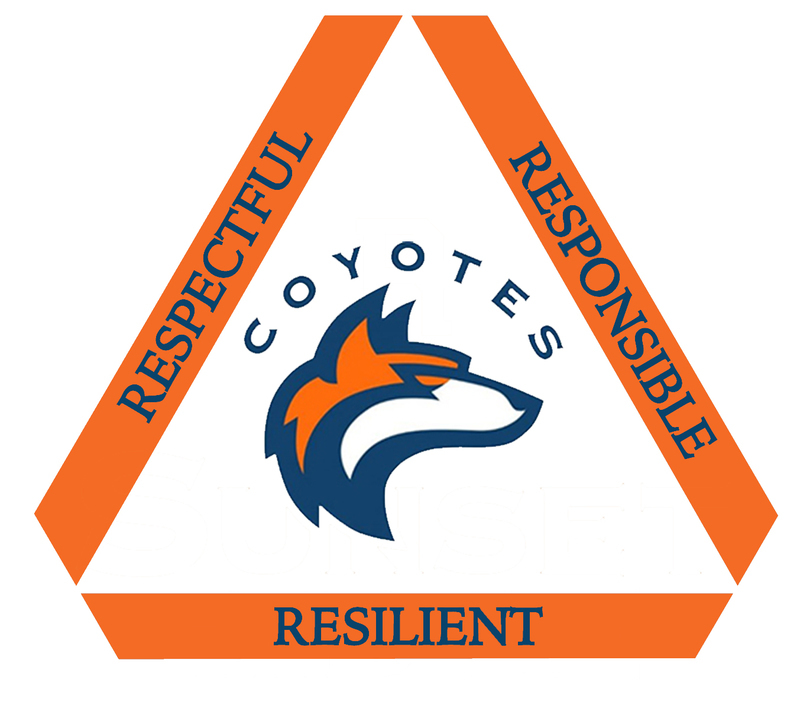 COYOTE BEHAVIOR - SUCCESS BOUND! GOAL: To create a social-culture in our school that will encourage positive behaviors and interactions, while discouraging problem behaviors. This social-culture will lead to a safe environment where students achieve academically and build positive relationships with each other and with adults. The foundation of the approach emphasizes teaching students the behaviors we expect to see, reminding them to use those behaviors, acknowledging them when they do, and correcting them when they do not. PARENTAL INVOLVEMENT: Teaching a behavior that schools expect to see works best when there is consistency across home and school settings. When a child exhibits challenging behavior at school, a strong partnership between the school and family is important. Family involvement is a key feature when developing positive behavior support plans for students with special needs. School-wide positive behavioral interventions and support is a school-wide approach to helping all children learn to self-manage behaviors. However, parent involvement is important in all aspects of PBIS. When parents are involved, outcomes for children are better.